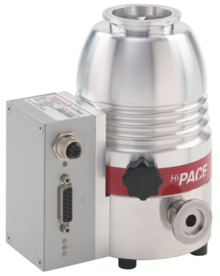 HiPace stands for a full range of compact and powerful turbopumps in the pumping speeds range of 10 to 2,050 l/s. It provides high cost-efficiency and flexibility, which allows almost all pumps of this range to be installed in any orientation. The proven bearing system guarantees unrivaled reliability. High pumping speeds, high backing pump compatibility and high gas throughput as well as excellent compression for light gases are made possible by the innovative rotor design.This bearing technology does not require electromagnets and has a long service life with maintenance intervals of approximately 4 years. The combination of a ceramic ball bearing on the fore-vacuum side and a permanent magnetic radial bearing on the high vacuum side is called hybrid bearing.